I went to the local Sherwin-Williams store this afternoon and left ten bucks lighter clutching a 12 ounce tub of oxalic acid. The label has lots on instructions on mixing it up as a wood bleach, but what's the dope on making it a rust remover? Depends on how much water you're using. I had some cable clips with light surface rust that came out gleaming after about a 2 hour soak. 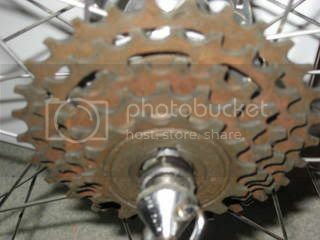 Conversely, I had a chain that was dry and bright orange - after a 2 day soak it looked and worked like new. It can be a lot less strong. Maybe start at 1/5 the amount of acid to water as is on the instructions. Mix it in warm water until the solution is saturated (Crystals no longer dissolve). If you want it weaker, add water from there. Always use warm water. FWIW I pay about $6/lb at Rockler woodworking for Oxalic acid. Wow - you mix it way stronger than I do. How's that work for you? Does the rust dissolve really quickly? Does anyone have experience with oxalic acid and plated parts? I'm thinking about nickel and chrome plating, primarily. I own a band instrument repair shop, and my 79 year old repair tech dips some parts in Lysol Toilet Bowl Cleaner. I'm wondering if oxalic acid is the active ingredient in that. Does anyone know? Almost all the parts I've done have been chrome plated - cable clips, chain ring bolts, binder bolts, headset cups, etc. Works great. You do have to clean/degrease the parts first, though. Oxalic acid needs to touch the bare surface, and will not work though grime or grease. Last edited by bigbossman; 05-11-07 at 09:13 AM. There are two sets of instructions on the container: 3 oz per quart to BLEACH wood and 3 oz per gallon for BRIGHTING wood decking. Do I use either of these or some other dilution? Lets put it this way: It sounds like Old Fat Guy is using way more that 3oz per quart, and bigbossman is using way less than 3oz per gallon. My own mix is somewhere in between the two extremes. It all depends on how fast you want it done and how often you want to restock the OA. Oxalic acid is a very mild organic acid. It has long been used to remove rust stains from fabric and will not damage fabrics. It is poisonous so wash your hands after using it or use gloves. I'll bet if you read the ingredients in your Tidy Bowl, you will probably see EDTA (ethylenediaminetetraacetic acid or one of its salts). EDTA is non-toxic and is also used in foods like salad dressing. 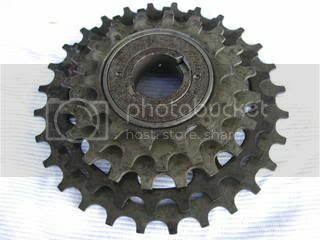 It's great for dissolving soap scum and dried minerals like calcium and magnesium but I'm not sure about removing rust (iron oxide) from parts. 10 bucks for less than a pound seems like a Tidy profit for the store. It's great for dissolving soap scum and dried minerals like calcium and magnesium but I'm not sure about removing rust (iron oxide) from parts. 10 bucks for less than a pound seems like a Tidy profit for the store. Give it a try, you'll be amazed. Here's where I buy mine. I actually make a paste of Zud cleanser and oxalic acid for larger things, like forks , fenders and wheels. Works great. You could also do the electrolysis thing with borax, water, a battery charger and sacrificial piece of steel. Brightening. The mix to bleach wood is much stronger than you'll need. Just give it a shot with the brightening ratio and see how it goes. I did disassemble it first, though. Chrome is fine, I don't know about nickel. DON"T use it on zinc or cad plating, the acid will eat the plating and leave you with dull metal. The tiny bubbles coming off the plating during the process are pretty cool though. I am going to have to find a local source. The Chemistry Store would cost $32 for a minimum order and S&H. Yeah it ended up costing me $29 for a 7lb pail delivered to Texas but I'm so far out in the sticks I don't have any other options. That's why I don't mix it as strong as Old Fat Guy does, and at the rate I'm using it it should last a couple or three years. Last edited by McDave; 05-11-07 at 08:27 PM. I found out that there is a chemical supply house here in town that is supposed to stock it. I had been to home depot and they just had the deck wash that was a weak solution for $10/gal. If I can find a cheap supply, I figure I won't have to worry about using it so sparingly. OFG's Rossin fork did turn out nice. Wet the stain and sprinkle PURE OXALIC ACID on it. Rub with a wet cloth, sponge or brush until stain has vanished. Rinse thoroughly and wipe dry. For more stubborn stains, make a paste of PURE OXALIC ACID and water, apply to the stain and allow to stand a minute or two before rubbing. Rinse and wipe dry. To whiten iron stained clothes, presoak using 4 tablespoons of PURE OXALIC ACID in 2 gallons of water. PURE OXALIC ACID can also be sprinkled in the toilet bowl and other porcelain surfaces to clean embedded rust and hard water stains. Like I said above, a paste made with Zud cleanser and OA, rubbed or steel wooled onto the surface works in a few minutes. Borax will neutralize the OA, if needed. I thought the fork on the Rossin was junk, but as you can see in my earlier post, a bit of elbow grease and OA works wonders. If I can find a cheap supply, I figure I won't have to worry about using it so sparingly. Note: Even using it fairly sparingly doesn't reduce it's effectiveness. It just takes longer to do it's job. OFG brings up a good point - using Borax to neutralize the acid when finished treating. I had a case where treating cheap shorty fenders the acid seemed to continue working even after I rinsed and polished. I noticed a couple weeks later that it left dull specks down to the steel where the rust spots had been. I now rotate the old box of Baking Soda out of the fridge into my OA rinse baths to ensure the acid stops working. What works on aluminum? I have a pair of shorty Weinnman fenders which need to be cleaned of corrosion spots. I have used mag/alum wheel polish but it does't get it all. I found a small tub of it labelled Wood Bleach at a True Value store. Ace may have it as well. Cost less than $10 if I remember correctly.